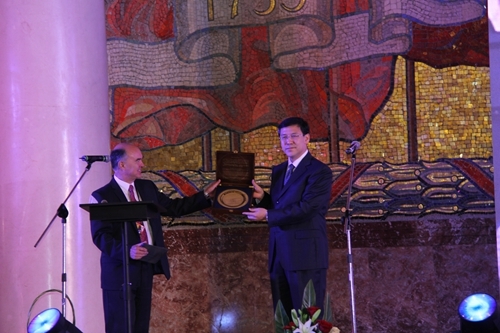 On August 4, 2014, Prof. Martin Sweeting from the University of Surrey, UK, was awarded the 2014 CAS/COSPAR Jeoujang Jaw Award at the opening ceremony of the 40th COSPAR Assembly held at the Lomonosov Moscow State University. Prof. YIN Hejun, Vice President of the Chinese Academy of Sciences (CAS) and President of the Chinese National Committee for COSPAR (CN-COSPAR), attended the opening ceremony and presented the award to Prof. Martin Sweeting. Prof. Martin Sweeting was named as the recipient of CAS/COSPAR Jeoujang Jaw Award for his pioneering concept of utilizing commercial “Off-the-shelf” (COTS) devices in the micro-satellites which are rapid-responsive, low-cost and of high-capability. "This concept and his endeavor in making the COTS devices gradually changed the world of space industry and the related economy and politics to the point that not only big space countries can launch a space mission, but also small developing countries and even university students can make and operate a satellite", Prof. YIN Hejun said at the awarding ceremony. The CAS/COSPAR Jeoujang Jaw Award was jointly set up by CAS and COSPAR in 2006. So far, it is the 8th COSPAR award. The award is bestowed to scientists and engineers who have made outstanding contributions to space research by establishing new space science research branches, proposing pioneering space exploration programs and in general extending the knowledge of human being.